1. My vision is really odd. My right eye is afflicted with myopic astigmatism (nearsightedness) and I’ve hyperopia (farsightedness) in my left eye. I wear prescription glasses but I’m totally able to get away with not wearing them. 2. The last time I took a typing certification test, I clocked in at 93 wpm, corrected. That was a while ago and I’m quite certain I’ve become faster since then. 4. My dreams are extremely vivid and can be quite spooky sometimes. 6. I love poetry, and I am particularly enamored of the sonnet. William Shakespeare and Edna St. Vincent Millay are gods, as far as I’m concerned. 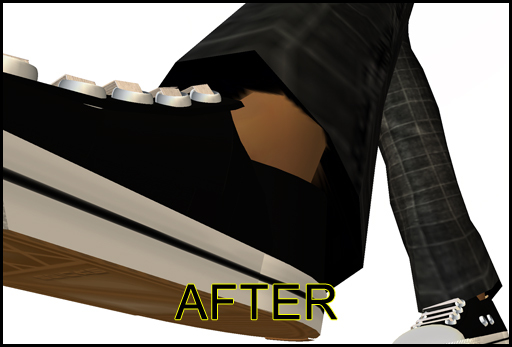 One thing I’ve never liked about wearing system layer pants in SL is the ugliness that occurs on the area that’s between your avi’s ankle and the leg flare of the pants. As I’m sure most of you are already aware, the area takes on your avi’s skin texture, resulting in an unsightly and unnatural sort of “fleshmelt” as I once heard someone describe it. The glove layer sleeves work in the same manner for your shirt and jacket layer items that have loose sleeves. Because tinting them is super easy, I’ve been able to use these babies with my colorful kimonos, and they’ve blended together without any problem or confusion. These have become an indispensable part of my SL wardrobe; I use them so much that I simply keep them in a folder marked “!FAVORITES” for easy access. 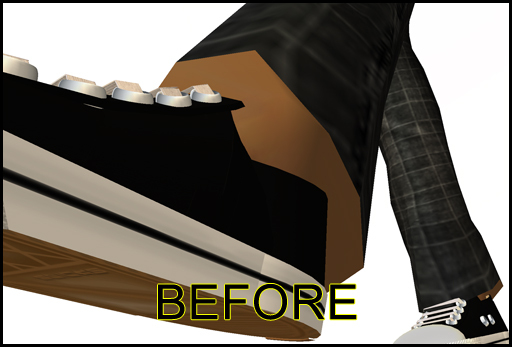 You can purchase the pantleg socks and sleeve gloves together as a set at NanoGunk. P.s. If you’ve not yet heard the name Ryker Beck, then do yourself a favor and get acquainted with her via her blog and her flickr stream. The woman is a freakin’ genius with Photoshop, and her blog is chock full of goodness, including some of the most thorough reviews on skins you’ll ever come across, including her latest write-up on Eloh Eliot’s wonderful skins. Smoky eye makeups from Rac! I’ve been waiting for this day for a long time, now… my favorite skin from RaC has been updated with more makeup options! Mallory Cowen, one-half of the duo that runs RaC, has just announced a HUGE release of skins — older favorites such as Emma and Carina, as well as the newer faces belonging to Tasha (I love Tasha, too) and Sofia, have each been given six more makeups, all of them with smoky eyes.